Rhode Island’s most important resource is changing, and so is life under, on, around and above Narragansett Bay. The bay and its vital watershed are warming, key species are disappearing and unwanted guests are arriving. This biomass metamorphosis could transform the Ocean State’s culture, and, perhaps, its economy. “We have a culture here that is centered around what we catch and eat from Narragansett Bay,” said Tom Kutcher, baykeeper for Save The Bay. He then proceeded to rattle off some of the iconic marine species associated with Rhode Island: lobsters, clams, stripers, scallops, blues and winter flounder. Unfortunately, some of these Ocean State favorites are now hard to find (cod, winter flounder and scallops), others are heading for cooler waters to the north (lobsters and striped bass), and fewer and fewer bluefish are coming into the bay, because there aren't enough pogies to munch on. Biomass diversity and species populations in and around Narragansett Bay are being altered by complex and interlinked reasons — from changes in prey-to-predator ratios to overfishing in waters hundreds of miles away. However, climate change and its warmer temperatures, can be linked directly or indirectly to many of the reasons. The average water temperature in Narragansett Bay has increased by nearly 4 degrees Fahrenheit since the 1960s, according to data kept by the University of Rhode Island’s Graduate School of Oceanography. Climate change is stressing Narragansett Bay and its 1,700-square-mile watershed in many known and unknown ways. Scientists, fishermen, birders, surfers and swimmers are seeing changes in species diversity and populations. Impacts to salt marshes, which are vital to the bay’s health and thus Rhode Island’s future, aren’t going unnoticed. In fact, scientists began noticing the bay’s warming trend in the 1970s. The Brayton Point Power Station, pre-cooling towers, has been largely blamed for the decline of winter flounder, but Kutcher believes it’s too easy to fault a single cause for the vanishing numbers of his boyhood catch and other iconic bay species. He said Narragansett Bay’s web of life is much too complicated to point a finger at any one factor. In the 1960s, long before climate change became scientific fact, water discharged from the Brayton Point power plant in Somerset, Mass., was warming Mount Hope Bay, which feeds into larger Narragansett Bay. Fish populations began to decline in the early 1970s, according to the Environmental Protection Agency. Population declines and habitat damage accelerated after 1984, coinciding with a change for the worst, at least environmentally, in Brayton Point’s water-cooling system. In 2009, in order to comply with its water permit and to cease pumping heated water back into Mount Hope Bay, Brayton Point invested about $500 million into the construction of two water-cooling towers. The towers have since reduced the impact on the bay’s water quality, but they do nothing to slow the momentum of a changing climate. Despite snow in October 2011 and a recent winter that was particularly cold and icy, New England’s climate is warming, and Rhode Island’s economic jewel is feeling the heat. In 2012, the Northeast experienced the warmest March on record. Much of the rest of the year remained warmer than usual, as temperature records were broken. The climate hasn’t gotten any cooler in the time since. In fact, each of the past 37 years has been warmer than the 20th-century average, according to the Union of Concerned Scientists. The 12 warmest years on record have all occurred since 1998, and 2012 was the hottest year ever recorded for the contiguous United States. The recently released third U.S. National Climate Assessment documents, among many things, the impact a warming climate is having on the environment. Narragansett Bay’s water level has risen about 7 inches in the past century, but it’s the warming of the bay and its estuaries that is having an impact on the ecosystem’s biomass diversity. 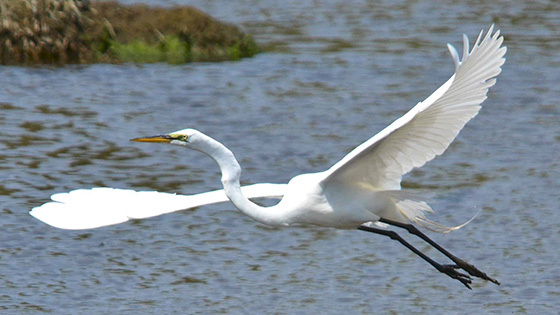 Estuaries, where salt and fresh water meet and mix, are breeding and feeding grounds for fish, shellfish and birds. A change in temperature can upset this ecosystem’s delicate balance. The changing climate is affecting the bay’s entire food chain, starting with phytoplankton. These microscopic organisms play a critical role in the food web, converting sunlight into energy and blooming in winter-spring as they cycle nutrients and carbon through Narragansett Bay. But the size of the bay’s phytoplankton bloom has declined by 70 percent since the early 1970s, according to a 2010 study conducted by researchers Leslie Smith, Sandra Whitehouse and Candace Oviatt. This decline can be attributed to many factors, but warming water temperatures are definitely one reason. Warmer temperatures, for example, can cause a spring bloom to occur earlier, before many species that depend on these tiny organisms are ready to take advantage of an earlier-than-expected buffet. Crabs, lobsters and many clam species release larvae when phytoplankton is dense enough for easy feeding and rapid growth. Temperature triggers often prompt these releases, Christopher Deacutis, chief scientist for the Narragansett Bay Estuary Program, wrote in a 2013 story. For many organisms temperature triggers may require a series of days or weeks at a specific temperature, he wrote. This eliminates false starts due to oddball days of unusual warmth or cooling, but what if the warming is steady and sustained? A new trigger date is the result, according to Deacutis. Sudden shifts in the abundance or scarcity of phytoplankton also impacts zooplankton, which feed prey fish, which feed game fish, which help sustain the local economy. Partly because of changes in plankton biomass, the balance of species in the bay is changing, from those that live on or near the bottom, such as winter flounder, to those that live higher in a warming water column, such as black sea bass and dogfish. Robert Kenney, Ph.D., an emeritus marine research scientist and professor-in-residence at URI’s Graduate School of Oceanography, wrote in a recent piece for the Rhode Island Natural History Survey that “it is interesting to speculate about what might happen in the future as ocean temperatures in our region continue to warm. More bottlenose dolphins off the Rhode Island coast could be fun, but their increased presence would also mean significant changes in the bay had occurred. The climate’s continued warming could, as some have predicted, eventually transform Narragansett Bay into a body of water more familiar to those now living in Virginia, Maryland and Delaware — Chesapeake Bay. Most of the the striped bass in Narragansett Bay, and in New England waters in general, come from the Chesapeake Bay. But fewer numbers of this popular species for recreational anglers are making their way up the Atlantic Coast, and malnutrition has been observed in many of the ones that do, according to the Chesapeake Bay Ecological Foundation (CBEF). The foundation says low numbers of Atlantic menhaden, the predominant striped bass prey within Narragansett Bay and along the Atlantic Coast, have impacted the growth, health and migration of striped bass. During the early 1990s older adult menhaden were severely overfished off New England, according to the CBEF. The resulting decline in older menhaden coincided with low recruitment of menhaden in major nursery areas and the initiation of health problems in Chesapeake Bay striped bass. The depletion of menhaden spawning stock continues. The Houston-based Omega Protein Corp. owns and operates the only remaining menhaden reduction fishery — the large-scale harvesting of the species for processing into products such as fish oil and meal. This fishery, the largest on the Atlantic Coast, competes with striped bass, birds, ducks, osprey, lobsters and crabs. Omega Protein, which manages an 11-boat fleet and holds a monopoly in the East Coast menhaden-reduction business, is beating the competition. In 2003, purse seining of menhaden for use in the reduction fishery was prohibited in Rhode Island waters. Similar provisions exist in state waters along the entire Atlantic Coast, with the exception of North Carolina and Virginia, where the bulk of the reduction fishery takes place. Purse seining for use in the bait industry is still allowed in Rhode Island waters. As filter feeders, menhaden convert plankton into their fleshy biomass, which is a direct food source for many species, including bluefish. The decline of pogies is being felt throughout the entire Narragansett Bay food web, and across Rhode Island’s commercial and recreational fishing industries. Menhaden are used as bait and chum by recreational fishermen, and as bait by lobstermen, Kutcher said. He also noted that menhaden remove nutrients from the water column by consuming them, growing — turning the nutrients into fish — and swimming out of the bay at the end of the season. Excessive nutrients in the water, mostly nitrogen from stormwater runoff, can lead to algae blooms, murky water, dead zones and fish kills, Kutcher said. But the many benefits of menhaden are only provided when there’s an abundant population. However, any time there is at least 1.5 million pounds of menhaden in the bay, Kutcher said the Rhode Island Department of Environmental Management (DEM) opens state waters to the private industrial purse-seine commercial bait fishery that uses aircraft to spot the schools, and then sends out a huge boat to scoop up to 120,000 pounds. Current state regulations may recognize the value of a base population of menhaden, but Rhode Island fails to consider that 2 million pounds is less than one-tenth of historic levels, according to Kutcher. He noted that striped bass favor menhaden, but when pogies aren’t abundantly available, stripers turn their feeding attention to lobsters. It’s estimated that striped bass annually consume three times the number of lobsters caught by the fishery. Menhaden aren’t the only prey species of fish that play a vital role in the health of Narragansett Bay. River herring also are a prominent converter of plankton into fish biomass. But New England’s dammed-up rivers and the emergence of pair trawlers have had an enormous impact on the region’s river herring population. Industrial trawlers have been reported to catch hundreds of thousands of river herring in a single net tow. Narragansett Bay fuels Rhode Island’s economy and drives the state’s tourism and fishing industries, and some 2 million people live in its watershed — which stretches well into Massachusetts — so any change to the iconic inlet’s composition sends ripples across the Ocean State and the region. The Rhode Island commercial fishing industry has felt the economic impact of the bay’s shift from cold-water to warm-water fish species. Since 1980, for example, winter flounder have declined by 90 percent, according to that co-authored 2010 study. The bay’s winter flounder population has largely been replaced by fish that are more accustomed to warmer waters, and not nearly as favored by commercial fishermen. Since 1981, annual winter flounder landings have dropped from nearly 10 million pounds to less than 2 million, according to DEM. This decline amounts to an annual economic loss of some $2 million, according to DEM estimates. Lobsters have been in decline since 2001, and rising bay temperatures are playing a part in the rapid loss of local landings, according to state officials. And just as warming waters chase some preferred commercial species away, it also provides friendlier conditions for unwanted guests. Southern New England lobster catches are declining significantly because of a temperature-sensitive bacterial shell disease that has been severely impacting the region’s lobster population. Rhode Island’s $2 million-a-year oyster industry now worries about a bacterium (Roseovarius crassostreae) that causes juvenile oyster disease. This disease causes a significant amount of annual mortalities of hatchery-produced eastern oysters cultured in the Northeast. Dale Leavitt, an associate professor and regional aquaculture extension specialist at Roger Williams University, has worked in the aquaculture field for more than three decades. He has estimated that 75 percent of a Rhode Island oyster farmer’s workload consists of controlling “fouling organisms,” creatures that cover bags and structures where oysters are grown. They limit water and nutrient flow, and can stunt oysters’ growth or even kill them. Most of these troublemakers are invasive species. Water temperature increases assist in changing the dynamics of marine invertebrate populations, and that impact can be far-reaching. For example, the wetlands and estuaries of Narragansett Bay are currently witnessing an invasion of Asian shore crabs, according to David Prescott, the South County coastkeeper for Save The Bay. The Asian shore crab, which was first noticed in the region in the late 1980s, is a prolific invasive species. A single female can produce 50,000 eggs three to four times during the summer; most native crabs reproduce only twice each season. This change from one invasive crab species to another can have a profound impact on an ecosystem, from changing the behavior of the seabirds that prey on them to the density of another crab population. Invasive green crabs, which arrived here in the late 1880s, can help protect and restore salt-marsh habitat by driving away Sesarma crabs, which destroy marsh grasses, according to research by Mark Bertness, professor of ecology and evolutionary biology at Brown University. However, invasive Asian shore crabs, which are pushing green crabs out, don’t seem to have the same effect on Sesarma crabs. The number of Sesarma crabs is growing, and coastal salt marshes of southern New England, including those in the Narragansett Bay watershed, are dying. Bertness and his students don’t believe this is a coincidence. In a paper published in March, the researchers provided the results of numerous measurements at 14 sites around Narragansett Bay. They sought correlations between the extent of marsh death and evidence of several other popular hypotheses. They found that runaway herbivory of cordgrass by Sesarma crabs is having a major impact. In another study, published in the journal Ecology Letters, the researchers tested that hypothesis with experiments on Cape Cod. The results were that wherever they protected these nocturnal burrowing crabs from the pressure of predators, the crabs ruthlessly mowed the grasses down. Both papers support the explanation that Sesarma crabs are ravaging salt marshes in part because of a loss of predators, such striped bass, to overfishing, a changing climate and other pressures. Rhode Island’s salt marshes filter out pollutants and provide a buffer to developed coastal communities, but their habitat value is priceless. The state’s salt marshes provide foraging grounds and nursery habitat for hundreds of species of fish, shellfish, mammals and birds. But in the past 300 years, more than 50 percent of Narragansett Bay’s salt marshes have been destroyed. Much of the remaining marshes have been damaged by watershed development and mosquito ditching. Mosquito ditches are narrow channels that were dug to drain the upper reaches of salt marshes. It was believed that such efforts would control mosquito breeding, but all that work did was drain salt marshes and kill off mummichogs, a mosquito-eating fish that are important prey for herons and egrets, and larger predatory fish. The loss of this important habitat has a wide ranging impact on bay-area life. For instance, Rhode Island is home to the endangered saltmarsh sparrow and piping plover. These small birds nest in salt marshes or along the shore. The Narragansett Bay watershed, in fact, provides foraging, nesting and resting habitat for some 185 bird species. McLeish noted, however, that raptors have made a comeback in the Narragansett Bay watershed, and birds such as osprey and bald eagles have become regulars. He said five bald eagles were recently spotted together on the Seekonk River. Not all change is bad. Climate change refers to more than just higher temperatures. Other climate-related changes being felt in region, such as a 25 percent increase in precipitation since the turn of the 20th century, the greater frequency of 2-inch rainfalls since the 1950s and storms once considered a 1-in-100-year event becoming more frequent, bring with them ecosystem impacts. Heavy rains and warm temperatures impact preferred marine habitat and the production by phytoplankton. These conditions combined with excess nutrients, specifically nitrogen, deplete oxygen, cause algae blooms, lead to fish kills and damage habitat. Problems caused by low oxygen levels are exacerbated by stormwater runoff and effluent from wastewater treatment facilities and septic systems/cesspools that contains high levels of nitrogen and phosphorus. Nitrogen and nutrient pollution remain the single greatest threat to the ecological health of Narragansett Bay, according to Save The Bay. Scientists recently reported that the nitrogen-converting process anammox is almost completely absent in Narragansett Bay, even though it is going strong in Rhode Island Sound. These findings raise intriguing questions about why the bay seems inhospitable to an important environmental process, according to Jeremy Rich, assistant professor of ecology and evolutionary biology at Brown University. The new study suggests that the bay somehow lacks the proper conditions to activate an important process in returning nitrogen from the sea to the air. “Past research suggested anammox might be increasing in importance in the bay, but there was not any data to back it up,” he said. “What we’re showing is it’s barely even there,” Rich said. One of Rich’s observations during his research has been that in Rhode Island Sound’s sediments, but not Narragansett Bay’s, little shrimp burrow and effectively promote the mixing in of oxygen. He said it’s speculation to blame a lack of the shrimp for the bay’s dearth of anammox, but he noted that it is worth considering. Algae thrive in waters that contain excess nutrients, such as nitrogen. These tiny, single-celled plants bloom in huge numbers, coloring the water and decreasing its clarity. Algae typically live for only a few days to a week and then sink to the bottom, where oxygen-sucking bacteria feed on the dead matter that has blanketed the bottom. It’s a vicious cycle that has created places, such as the bottom of Greenwich Bay, that are a barren wasteland for much of the year. Since oxygen levels typically are lowest in estuaries and coastal areas, where the water is poorly mixed and where harmful runoff, such as lawn fertilizer, is collected, nursery habitat for fish and shellfish often is impacted. Without nursery grounds, young marine life can’t find the food or habitat it needs to reach adulthood. The state’s 10-year goal of reducing nitrogen by 50 percent in upper Narragansett Bay will likely be met this year, and much of that success is due to the construction of the massive sewer and stormwater runoff collection system operated by the Narragansett Bay Commission. But there have been big losses along the way. The bay scallop was once prevalent in Narragansett Bay. However, the state’s scallop fishery was all but wiped out when disease, pollution and coastal development began killing eelgrass beds. Recovery has been slow. On Aug. 20 2003, Narragansett Bay experienced what many believe to be the worst fish kill in these waters in more than 50 years. More than a million fish, primarily juvenile menhaden, floated to the surface. Hundreds of small crabs, blue crabs, grass shrimp, horseshoe crabs and American eels also suffocated. However, not all of the impacts caused by nutrient overloads, low levels of dissolved oxygen, warmer water and overfishing are so in-your-face. Most changes are subtle and build over time.